If you are importing copies with your records, you will need to map the data in your holdings tag to fields in the copy record. Click the Holdings Import Profile button to map this information. Click the New Definition button to create a new mapping for the holdings tag. Add a Name for the definition. 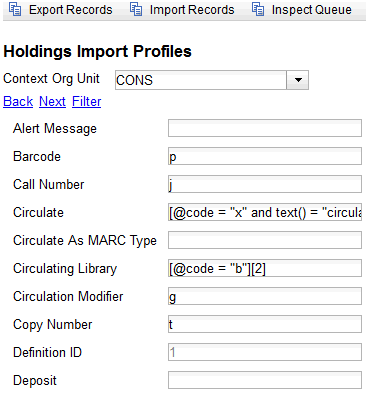 Use the Tag field to identify the MARC tag that contains your holdings information. Add the subfields that contain specific copy information to the appropriate copy field. Select the Keep box if Evergreen should keep this holdings tag in the record after it is imported. Otherwise, Evergreen will remove this holdings tag. At a minimum, you should add the subfields that identify the Circulating Library, the Owning Library, the Call Number and the Barcode. All fields (except for Name, Tag and Keep) can contain static values, a MARC subfield code (such as "a"), or an XPATH query. MARC Holdings Tag/Field (e.g. 949). Use the Tag field to identify the MARC tag that contains your holdings information. Of the format CATEGORY 1|VALUE 1||CATEGORY 2|VALUE 2. If you are overlaying existing copies which already have stat cats attached to them, the overlay process will keep those values unless the incoming copies contain updated values for matching categories.